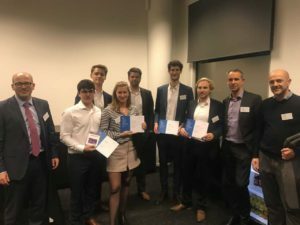 » MFM for the win at KPMG M&A competition! MFM for the win at KPMG M&A competition! On the the 8th of November, KPMG organized an M&A case in which several of the Vlerick students participated. According to the students it has been a very interesting afternoon, which ended in a presentation of the results. The goal of the competition was to evaluate an M&A bid, based on different aspects such as financial and strategic feasibility. Of course Vlerick was represented in the winning team thanks to one of the MFM students: Joel Vandenbroek. According to him it was a “great learning experience where you had the chance to see certain subjects from different perspectives”. Two months after the start of the academic year, many MFM students are looking at the job market and the possibilities available. As companies are organizing events and competitions for potential employees, there are a lot of opportunities for us. There are many more exciting things coming up in the following weeks. We will certainly keep you posted! Picture of the winning team at the KPMG M&A competition. This blog is meant as a platform for the current Masters students of Vlerick Business School, who will spend a year, studying at our campuses in Brussels, Ghent or Leuven. On this blog you will be able to read all about their experiences in the different masters programmes: Financial Management, General Management, Marketing Management, Innovation and Entrepreneurship or International Management and Strategy. The Masters classes are very varied groups with up to 40 nationalities, different professional background from engineers to architects, men and women, all sharing the same goal: completing their Masters year successfully to be able to make a successful start of their career.